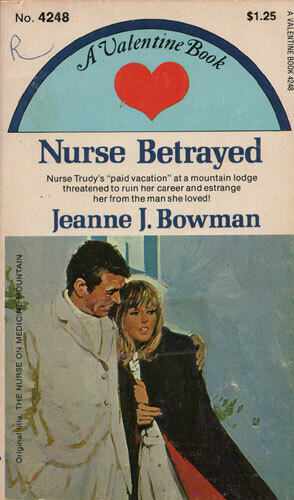 Nurse Trudy’s “paid vacation” at a mountain lodge threatened to ruin her career and estrange her from the man she loved! Nurse Trudy Holmes left Dane Memorial Hospital to care for the post-operative wife of wealthy Dr. Malcolm Morse. Dr. Morse painted a glowing picture of Medicine Mountain as a quiet retreat which would be more of a “paid vacation” than a nursing assignment for Trudy. Although she hesitated leaving the hospital and the two doctors she loved, Trudy accepted the assignment eagerly, for she had worked so hard for several years putting herself through nursing school and training at the hospital. But Trudy didn’t count on a pampered young debutante and an old country witch doctor complicating her life.